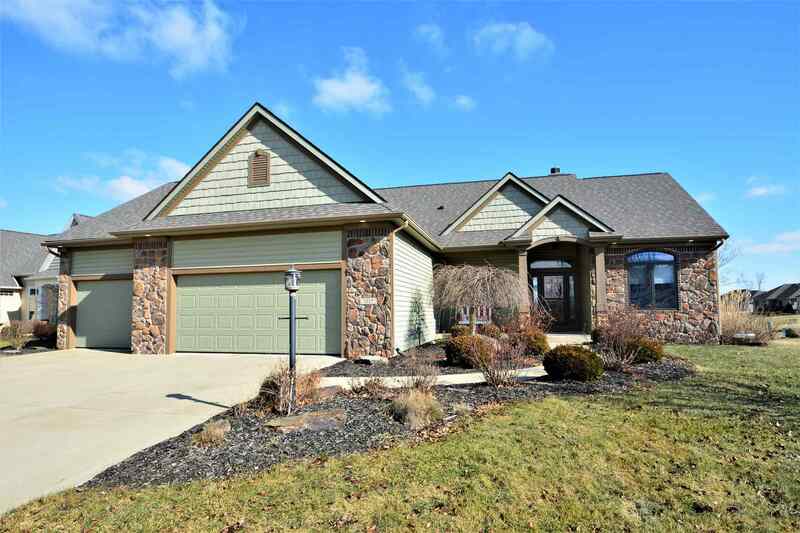 Beautiful ranch on finished daylight basement. Split bedroom floor plan. 4 bedrooms, 3 full baths and over 2700 of finished square feet. Waterfront view, 2 decks and SO much more. Upon entering the home, you will find an elegant entryway with crown molding and a transom window above the front door. This leads right into a large great room. The great room has an amazing 2 story stone fireplace , built in bookshelves and entertainment center, ceiling fan and a wall of windows overlooking the backyard and pond. The great room opens fully to the kitchen and breakfast room. The kitchen offers a large 2 level breakfast bar, granite counter tops, subway tile, pantry, stainless steel appliances and a gas stove. The large dining area has windows overlooking the deck and a nice sized butlers pantry. This includes additional cabinets with granite counter tops. Most of the main level have beautiful engineered hardwood floors. The master suite has a lighted trey ceiling, extra windows for natural lighting, double vanity with raised bowl sinks, garden tub with ceramic tile surround and a walk in closet. The additional two main level bedrooms are spacious with nice closet space. The 2nd full bath has ceramic tile floors and updated lighting. Also on the main level is the laundry room with cabinets. The daylight basement has a large family room with bar area, den and 4th bedroom. The 4th bedroom is 10 x 16 and has a 10 x 12 closet! Also in the basement is a 3rd full bath. Out back you&apos;ll find a double deck for outside entertaining, amazing waterfront views and still room to play. Jonathan&apos;s Landing has a very nice association pool.